When I decided to have a booth at the National Stationary Show, I had no idea what an amazing time I would have. 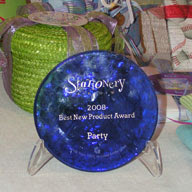 I entered the Fobbie® into the Best New Product competition in the Party category and won! We were located way in the back of the show and I worried we wouldn't get much traffic. Visitors seeing us in the Winner's Circle helped get people to the booth to see the Fobbie® in action. I met so many great shop owners, press people, exhibitors and supply folks. Everyone was enthusiastic and helpful, which made our time there great fun. So if anyone who came by the booth reads this, thank you for your support and good wishes! Fobbie, Gift Wrapping in a Cinch! is a quick, new, easy and creative way to gift wrap. This blog will talk about creative ways to gift wrap, alternative uses, and fun ways decorate do-it-yourself fobbies. 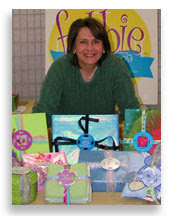 I am the inventor of the Fobbie® a new, quick and easy way to gift wrap. I hope to show you creative ways to wrap with the Fobbie®. This is my baby and labor of love. I live in a cabin in the mountains of Colorado. I've had a lot of pine beetle kill in my pine trees, so I became a rustic woodworker as a way of recycling the wood. I make ornaments and candles stamped with moose and bear. One night while reading an article on handmade gift tags I wondered how I could attach my ornaments to a package for decor. In the middle of the night I woke up with my idea for the parallel slot attaching system. Please send me images of the ways you wrap with the Fobbie®, or ideas of Fobbies® you'd like to see.